This has been an amazing week. We decided to ask Tierney Sutton, the jazz vocalist non-parallel if she would join us as a special guest for our upcoming concert at the Iridium jazz club in NYC. She said yes immediately, which was extremely gratifying. Tierney will be collaborating with us on the upcoming Poets and Prayers program we’ll be presenting next season. Our first concert has already been booked, and is slated for October 27th in Tempe, Arizona, so this will be somewhat of a preview of coming attractions. Last night was the very first rehearsal of Force of Nature. I was taken directly from the airport to the rehearsal at Northern Virginia Community College in Alexandria, Virginia. The first surprise was meeting the orchestra’s general manager, Adrian Finlay. Dressed causally in blue jeans and tea shirt, Adrian greeted me quite amicably at the front of the hall. Adrian and I had spoken about this program quite a long time ago, so it was great to finally meet him in person. He escorted me backstage, where there were sandwiches and sparkling water waiting in the green room. After a quick look in the fridge, I made my way to the stage where the stage manager was waiting for me. Craig is a percussionist and apparently stage- manages many groups in the Washington DC area. He had really thought through many of the issues David and I usually face when performing with orchestras with Turtle Island. I was grateful to have his thinking, especially since we only have two rehearsals to get this very new program together. He had positioned the drum set used on Force of Nature centered directly behind the conductor, Kim Allen Kluge. The drummer, Don played extremely sensitively throughout the rehearsal. I had asked Craig for a Plexiglas sound barrier, thinking that the drums would be loud. I was wrong, and by the end of the rehearsal, I asked for it to be removed. I was pretty excited for this first rehearsal! So many months of preparation and practice were finally coming to fruition. 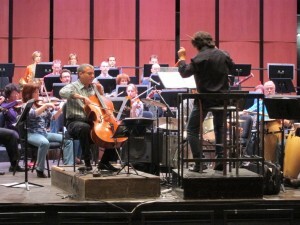 The orchestra was waiting when I mounted the cello podium. They are a really nice group. The concertmaster, Claudia is terrific, and the whole vibe of the orchestra is warm and easy going. I was able to talk easily to the whole group, and I let them know that we were excited to be playing with them and were expecting them to groove with us. If we couldn’t get it to happen, it was our fault. I think they were encouraged by the positive attitude, which extended from the conductor Kim as well. More to come!